In perhaps a bit of good news, sales of existing homes increased in February, trumping most analysts' forecasts. The National Association of Realtors said Monday that existing home sales surprisingly rose 2.9 percent to a seasonally-adjusted 5.03 million unit rate last month, up from a 4.89 pace in January -- soundly beating some pretty glum analyst forecasts. Bloomberg News' survey of experts had pegged the February rate at an expected 4.85 million, which would have been slowest pace for existing home sales since the NAR first started keeping records in 1999. Rather than the worst sales volume number in the history of NAR record-keeping, however, what we did get was the worst such February reading in 10 years. Per the Calculated Risk blog, some context: the graph at the right provides existing home sales all the way back to to 1993. 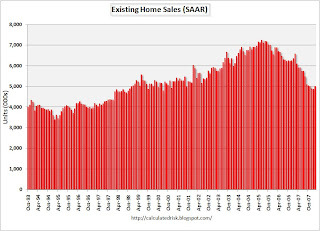 Single-family home sales increased 2.8 percent to a seasonally-adjusted annual rate of 4.47 million in February, the NAR reported, from an upwardly-revised 4.35 million in January. Existing condominium sales rose 3.7 percent to a 560,000 unit rate from a downwardly-revised 540,000 in January. Total housing inventory fell 3.0 percent at the end of February to 4.03 million existing homes available for sale, which represents a 9.6-month supply at the current sales pace, down from a 10.2-month supply in January. Most housing experts look at inventory in assessing the overall health of the housing market, particularly in times of market stress. The drop in inventory is a step in the right direction, but comes ahead of the traditional spring selling season. Most sources that spoke with Housing Wire expect inventory to resume its upward climb in the coming months as homeowners look to put more homes on the market. "It's tough to pull too much out of today's report, beyond the fact that it was better than we'd expected," said one source, an analyst at a large Wall Street investment bank. "Spring selling is just around the corner, so I think you'll see much more emphasis on the March and April reports, and if those show better-than-expected activity, then we'd have something to talk about." Even the NAR's Lawrence Yun, chief economist at the realtor-led organization, was preaching caution and telling reporters on a conference call Monday that he "would not read too deeply into a single month's data."